Although technology is ubiquitous in healthcare, its impact on people's perceptions and lives is poorly understood. Fresh insights are required to meet current and future technology-related policy challenges. Keeping a population healthy requires considering not only technologies that are used in clinical settings (diagnostic, therapeutic, palliative), but also those used in the community (home care, self-care, technical aids) and those that affect health more broadly (health promotion technologies, occupational health technologies). At the policy making level, understanding the desirability of health technology may prove to be more important than simply appraising its affordability. This paper argues that the reasons technology matters in healthcare, and its impact on people's perceptions and lives, are poorly understood. Fresh insights are required to meet technology-related policy challenges. So far, applied health research has portrayed health technology as both a tremendous opportunity to improve the lives of patients and a major threat to the financial sustainability of public healthcare systems (Lehoux 2006). As a result, research has focused mainly on the measurement of cost and effectiveness - helping decision-makers ponder technology's affordability given the prevailing budget constraints - and has provided very little insight into the question of its desirability, e.g., the reasons for its being socially valuable or not. From such an overly optimistic perspective, technology evokes modernity; whatever is newest is supposed to be better. Furthermore, health innovation is usually equated with "high-tech" medicine, while social innovations (i.e., employment or housing policies) and public health interventions are left aside. This understanding is rooted in recent history. In the 1980s, "health technology" referred to all instruments, devices, drugs and procedures that were used in the delivery and organization of healthcare services (US Congress 1985: 3). This definition included technologies that were pivotal in supporting hospital work (e.g., information systems, surgical rooms, sterilization systems). Since then, technological developments have significantly reconfigured the centrality of the hospital in modern medicine by enabling new healthcare delivery models wherein the responsibility of patients and their relatives significantly increases (e.g., home and ambulatory care). This profound technology-driven change has not been fully acknowledged. 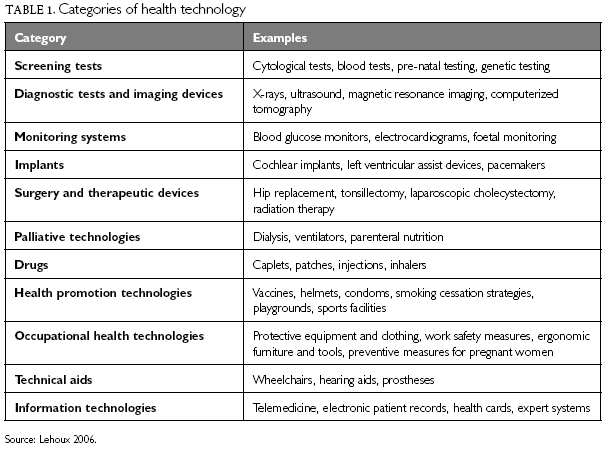 Table 1 provides examples of various technologies that are currently used in and around healthcare systems. Some of these technologies are not tools used by clinicians; rather, they are used in the workplace or community and affect health by preventing disease, injury or exposure to deleterious products or practices. In addition, several "mundane" technologies (e.g., blood glucose monitors, syringes) contribute profoundly to the effectiveness of healthcare (Lehoux et al. 2004). The emergence of Severe Acute Respiratory Syndrome (SARS) in Toronto, Canada, vividly illustrates how effective detection and control of contagious cases relies on the appropriate use of simple tools such as ear thermometers, hand washing and facial masks - and fails when such tools are inconsistently applied in practice (Poland et al. 2005). Hence, a technology is rarely just a stand-alone "high-tech" device that generates measurable costs and benefits; it is one component of larger healthcare and social systems. Without an adequate conceptualization of the social embeddedness of health innovation, most research initiatives trying to understand and assess technology will remain incomplete. Policy questions cannot be answered through cost-effectiveness analyses alone. And, more importantly, the need to consider alternative policy options and pressing ethical questions calls for a different kind of research. Beyond clinical efficacy, what is the value of specific innovations? What impact do they have on clinical practice, population health and social development? Why do clinicians trust and use certain innovations instead of others? Why do patients expect, demand or reject specific interventions? And how does technology really affect the health and well-being of the population? • Technology structures the delivery, use and outcomes of healthcare. • Non-medical variables influence the effectiveness of health technology (e.g., emotions, knowledge, values, beliefs, cultural practices, social interactions, organizational structures and processes, financial incentives, regulatory frameworks). • Providers and patients do not use, perceive or value technology in any consistent way; outcomes therefore vary. • The use of health technology triggers social changes and raises ethical concerns. • Technology modifies the settings in which healthcare practices take place and influences the appropriateness and effectiveness of health technology. • Because technology modifies the expectations of patients and the general public with respect to health and healthcare, its regulation requires a broad understanding of the policy arena. Social scientific research has established the notion that technology is not simply a neutral tool (Brown and Webster 2004). Rather, it is a normative intervention in the social world, too often taken for granted. Technology deeply modifies how healthcare providers and patients interact and the paths of action they can and should take. For instance, because the belief that information is valuable in itself is such a powerful cultural norm, when screening tests are made available they easily become part of established practice and therefore difficult to oppose (even when an appropriate treatment does not exist). One example of this is the use of electronic foetal monitoring, which can play a significant role in medical liability suits if something goes wrong during a delivery (Johri and Lehoux 2003). Consequently, it is used extensively despite solid evidence indicating that it is effective only in high-risk pregnancies. Hence, technology tacitly forces certain kinds of clinical practices and frames women's experiences of birth delivery. Another example comes from Greer et al. (2002), who examined how differences between physician-patient interactions in urban and rural locales could explain higher rates of mastectomy (versus lumpectomy) in breast cancer treatment in some parts of the United States. Greer's study is especially insightful because the researchers did not assume a priori that these women's rationality was deficient or that prioritizing health and bodily appearance over other life activities (e.g., taking care of the grandchildren, the farm) should drive their decisions. Its perspective was strongly rooted in an academic tradition - sociology - that observes and conceptualizes social practices. The study's goal was not to find ways of improving physician or patient "compliance," wrongly assuming that the role of social scientific research is to help clinical practice achieve its mission. Rather, Greer aimed to understand why gaps between clinical practice guidelines and actual practices are observed and how they are sustained. Only by maintaining an independent and conceptually committed sociological perspective can this form of research tell us about the extent to which providers' and patients' perceptions and values affect the real-world use and outcomes of health technology. A common conceptual shortcoming in applied health research is to consider that ethical and social issues arise after a given innovation has been put to use, as if such issues could be divorced from the design process (Faulkner et al. 2003). Values are conceptualized as if they were located in society (or end users), not in the technologies themselves. However, technologies encapsulate values, and their design shapes user behaviour, thereby introducing new norms into practices (Oudshoorn and Pinch 2003). Compromises between the views of designers, CEOs, shareholders and clinicians are negotiated and generally rely on claims made on behalf of patients and society, often without direct input from patient or community groups. Such negotiation means that innovations, when introduced into the clinical market, may not be aligned at all with what patients and communities value or are willing to endorse (as the case of cochlear implantation has vividly demonstrated). There are many other, similar examples that underscore the relevance of turning to the social sciences to better understand technology's role in health and society (Brown and Webster 2004). Still, one fundamental reason to turn to the social sciences is for conceptually reframing what technology is and does, and what its desirability means for various groups. A technology can be considered desirable by certain groups (engineers) and not others (patients). And it can be considered justifiably desirable or not. Unreflective "desires" should not be confused with desirability. Desirability is an inter-subjective notion that requires a technology's purpose and impact to be examined, debated and established by applying several disciplinary and lay perspectives (Lehoux 2006). Researchers thus need to make explicit, reflect on and confront the normative assumptions that underlie the "face value" desirability of various categories of technology (see Table 2). These assumptions remain tacit most of the time because, among others things, technology is considered (by most) a product of clinical and social progress. Nevertheless, these assumptions drive the development, dissemination and use of health technology, which then plays a pivotal role in the transformation of our existence (Ihde 1990). The desirability ascribed to clinical interventions often evolves over time, rendering the social and technological unfolding almost invisible. For instance, pre-natal screening could not have emerged as a socially accepted clinical practice if the clinical, social and legal movements towards the recognition of abortion had not been achieved beforehand. These social and technical changes, plus the seemingly unrelated in vitro fertilization techniques, were all essential for today's stem cell research to grow. It is thus necessary to examine critically the views and values of members of the public and patients. Jepson and colleagues (2007: 9), who examined experiences of screening programs for colorectal, breast and cervical cancers, argue: "Current strategy tends to concentrate on providing information on the benefits and limitations of screening. However, the findings from this qualitative research suggest that people want contextual information to make sense of the screening tests." This includes information on the severity of the disease and the broader context of self-management, such as risk factors and symptoms. For these authors, the term "informed consent" is problematic because the information provided seems to have little effect on choice, but greater effects on anxiety and satisfaction. Hence, technology from a social scientific perspective actively mediates life and death, health and risk, knowledge and uncertainty, autonomy and mobility. Because we are human, it generates wonder and sorrow, creates hope and anxiety (Callahan 1990) and generates power and authority (Blume 1992). Trying to ignore such influential socio-political dimensions will always prove deceptive. Because technology is often seen as the main cost driver (Cohen and Hanft 2004), applied health research, and more specifically Health Technology Assessment (HTA), has sought to better inform policy making by examining costs and benefits. The main assumption is that the budget for healthcare is a closed envelope (Banta and Luce 1993). Rational choices therefore must be made in order to sort out "good" innovations from "bad" ones, and in order to select only those that yield high value for money in terms of clinical effectiveness. While this view is valid, it nonetheless frames the "problem of health technology" in a way that is misleading. The problem is reduced to questions of affordability and payment: Can healthcare systems absorb the costs of innovations? And who will pay for them? The presumption that decision-makers - armed with HTA findings - can sort out affordability vis-à-vis budget constraints in a straightforward manner is contentious. Cost-effectiveness experts themselves do not believe that such information can provide a value-neutral ground for decision-making. A recent study by Gold and colleagues (2007: 70) shows that lay participants who were asked to act as "social decision-makers" and rank 14 condition-treatment pairs for coverage can be "clearly influenced by cost-effectiveness information." However, these authors report that the effect was not uniform and that "many behaviorally mediated illnesses were given less priority than would be expected on the basis of cost-effectiveness alone." This result suggests that perceptions and values may be more powerful in shaping one's judgments than data about costs and effectiveness. If this is the case, then it would be advisable that the values underlying technology-related decisions be made explicit and publicly accountable. In fact, the affordability argument will always remain a slippery slope for Canadian decision-makers, especially in a context where pressures are growing for a greater role of the private sector in healthcare. Denying access to technology on the basis of a collective economic rationality will be resisted time and again because the few individuals who have the ability to pay will be powerful and convincing (Giacomini et al. 2003; Johri and Lehoux 2003). Thus, the ultimate question remains political: Who can afford innovations? Because there may be no limit to what wealthy societies (let alone individuals) are ready to invest in health, being able to define and justify what makes certain health technologies socially more desirable than others may prove to be more important than solely appraising their affordability. The approach this paper suggests requires both deliberative processes and new forms of empirical research in order to inform policy. A new policy-oriented research agenda can be developed by tapping the significant body of knowledge already produced by social scientists about the social dimensions of innovation and about ways to deal with policy issues. As suggested by Table 1, keeping a population healthy requires considering not only technologies that are used in clinical settings, but also those used in the community and those that affect health more broadly (in the workplace, for instance). Because healthcare comprises competing and conflicting objectives, not all of which are worth pursuing, a more informed reflection on what people want from technologies is needed. 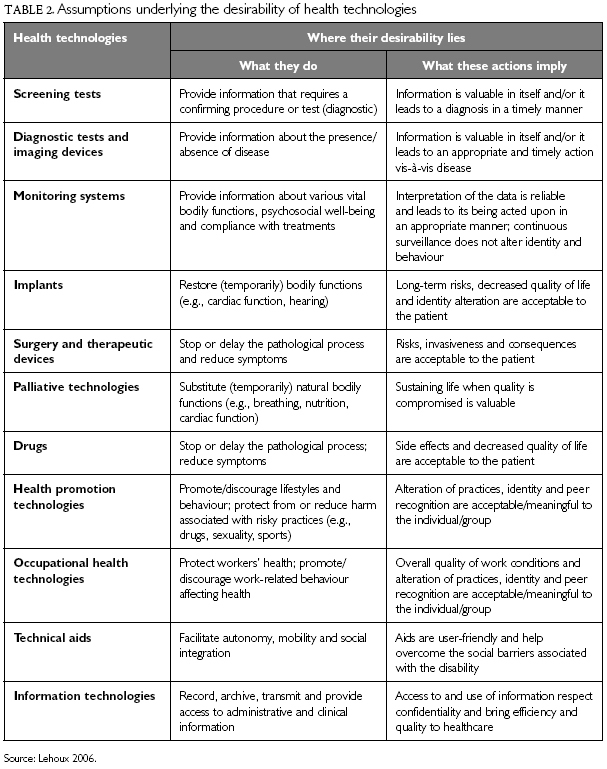 Technology-related evaluation and decisions require making explicit the normative assumptions that stakeholders (patients, relatives, clinicians, managers, taxpayers, industry, regulatory bodies, researchers) hold about specific kinds of technological and social innovations and to put to test these assumptions. Taking this perspective, Table 2 offers a series of assumptions that both researchers and policy makers can revisit when trying to ascertain whether innovations are justifiably valuable or not. Although technology appears ubiquitous in healthcare, a sharper understanding of its real-world use is required, one that is sensitive to, but also challenges, the perceptions and values of clinicians, patients and social groups. In what ways is a given innovation to be considered individually or socially desirable? Are those reasons publicly justifiable? Such questions can be tackled only by clinicians and health researchers who take seriously the social scientific perspective and the stakeholders' views. Bien que la technologie soit très répandue dans le domaine de la santé, on saisit mal son incidence sur les points de vue et la vie des gens. Une meilleure compréhension s'impose si l'on veut relever les défis actuels et futurs en ce qui a trait aux politiques liés à la technologie. Maintenir une population en santé exige non seulement des technologies qui sont utilisées dans des cadres cliniques (diagnostiques, thérapeutiques, palliatifs), mais également des technologies utilisées dans la communauté (soins à domicile, soins auto-administrés, aides techniques) et celles qui touchent la santé dans son ensemble (technologies visant la promotion de la santé, technologies en milieu de travail). Sur le plan de l'élaboration des politiques, comprendre dans quelle mesure les technologies de la santé sont souhaitables pourrait s'avérer plus important que simplement évaluer leur caractère abordable. Correspondence may be directed to: Pascale Lehoux, Associate Professor, Department of Health Administration, University of Montreal, P.O. Box 6128, Branch "Centre-ville," Montreal, QC H3C 3J7; tel. : 514-343-7978; fax: 514-343-2448; e-mail: pascale.lehoux@umontreal.ca. This paper largely draws on the author's book (Lehoux 2006), where Figure 1 and Tables 1 and 2 first appeared. During the preparation of the monograph (2003-2005), the author held a Career Award from the Institute of Health Services and Policy Research (CIHR). She now holds a Canada Research Chair. Pascale Lehoux would like to thank two anonymous reviewers and Brian Hutchison and Raisa Deber for helpful criticism. Several colleagues and graduate students provided useful comments on various versions of the chapters of the book on which this paper draws. Banta, H.D. and B.R. Luce. 1993. Health Care Technology and Its Assessment: An International Perspective. New York: Oxford University Press. Blume, S.S. 1992. Insight and Industry - On the Dynamics of Technological Change in Medicine. Cambridge: MIT Press. Brown, N. and A. Webster. 2004. New Medical Technologies and Society: Reordering Life. Cambridge, UK: Polity Press. Callahan, D. 1990. What Kind of Life: The Limits of Medical Progress. Washington, DC: Georgetown University Press. Coddington, D.C., E.A. Fischer, K.D. Moore and R.L. Clarke, eds. 2000. Beyond Managed Care: How Consumers and Technology Are Changing the Future of Health Care. San Francisco: Jossey-Bass. Cohen, A.B. and R.S. Hanft with W.E. Encinosa, S.M. Spernak, S.A. Stewart and C.C. White. 2004. Technology in American Health Care: Policy Directions for Effective Evaluation and Management. Ann Arbor: University of Michigan Press. Ellis, D. 2000. Technology and the Future of Health Care: Preparing for the Next 30 Years. San Francisco: Jossey-Bass. Faulkner, A., I. Geesink, J. Kent and D. Fitzpatrick. 2003. "Human Tissue Engineered Products - Drugs or Devices?" Editorial. British Medical Journal 326: 1159-60. Giacomini, M., F. Miller and G. Browman. 2003. "Confronting the 'Gray Zones' of Technology Assessment: Evaluating Genetic Testing Services for Public Insurance Coverage in Canada." International Journal of Technology Assessment in Health Care 19(2): 301-16. Gold, M.R., P. Franks, T. Siegelberg and S. Sofaer. 2007. "Does Providing Cost-Effectiveness Information Change Coverage Priorities for Citizens Acting as Social Decision Makers?" Health Policy 83: 65-72. Greer, A.L., J.S. Goodwin, J.L. Freeman and Z.H. Wu. 2002. "Bringing the Patient Back In: Guidelines, Practice Variations, and the Social Context of Medical Practice." International Journal of Technology Assessment in Health Care 18(4): 747-61. Ihde, D. 1990. Technology and the Lifeworld: From Garden to Earth. Bloomington: Indiana University Press. Jepson, R.G., J. Hewison, A. Thompson and D. Weller. 2007. "Patient Perspective on Information and Choice in Cancer Screening: A Qualitative Study in the UK." Social Science and Medicine doi:10.1016./j.soscimed.2007.04.009. Johri, M. and P. Lehoux. 2003. "The Great Escape? Health Technology Assessment as a Means of Cost Control." International Journal of Technology Assessment in Health Care 19(1): 179-93. Kazanjian, A. 2004. "Reflections on the Social Epidemiologic Dimension of Health Technology Assessment." International Journal of Technology Assessment in Health Care 20(2): 167-73. Lehoux, P. 2006. The Problem of Health Technology. Policy Implications for Modern Health Care Systems. New York: Routledge. Lehoux, P., J. Saint-Arnaud and L. Richard. 2004. "The Use of Technology at Home: What Patient Manuals Say and Sell vs. What Patients Face and Fear." Sociology of Health and Illness 26(5): 617-44. Oudshoorn, N. and T. Pinch. 2003. How Users Matter: The Co-Construction of Users and Technology. Cambridge, MA: MIT Press. Poland, B., P. Lehoux, D. Holmes and G. Andrews. 2005. "How Place Matters: Unpacking Technology and Power Relations in Health and Social Care." Health and Social Care in the Community 13(2): 170-80. US Congress. Office of Technology Assessment. 1985. Medicare's Prospective Payment System: Strategies for Evaluating Cost, Quality, and Medical Technology. Washington, DC: Government Printing Office.